I had a very busy and productive weekend. The weather was perfect to do a lot of outside scrubbing, cleaning, painting and planting. I was even able to squeeze in a trip to Babe’s Blossoms to pick up my first load of plants on Saturday and got all the plants in on Sunday afternoon in the midst of other projects I had going. This dresser has been bouncing around our family for a number of years. I bought it second hand ages ago and gave it to Kerry about twenty years back when she was in college. She kept it through the first years of marriage and then when Taylor came along, she painted it yet again and turned it into a changing table for the nursery. It worked great and then two and half years later and another coat of paint and new drawer pulls, it became the changing table for baby Ella. Now, 4 years later it has been permanently replaced, mostly because the bottom of the lower drawer completely fell apart leaving the drawer bottomless and useless. To give this chest another “life” I had my handymen, Butch and Rod, put shelving in where the two drawers previously occupied. 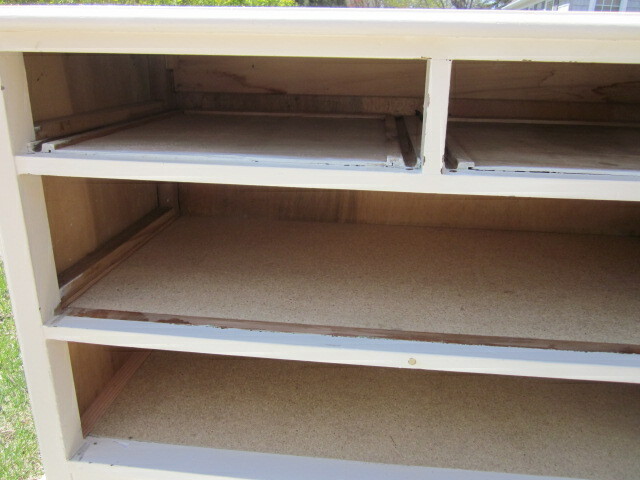 Next, the interior needed to be painted yet another coat of paint and new drawer pulls were added. This has become a cute quilt cupboard for all those quilts that look like they belong in a sweet little girl’s room at Grandma’s house. The top two drawers are perfect for stashing small treasures. To think this was on its way to the trash. MORE OLD BECOMING NEW AGAIN…I really can’t resist a good flea market find. 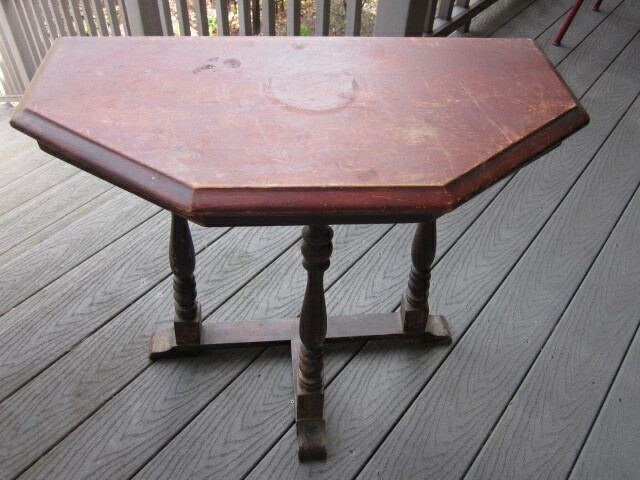 This little table has so much character and is such a good size. It has been hanging around for a few years and it is time to make it “new” again. Today is the day! It will be perfect in so many places in my house. Just enough space for a book, beverage or a cute accessory. I pulled a page from a 2015 Country Living issue. 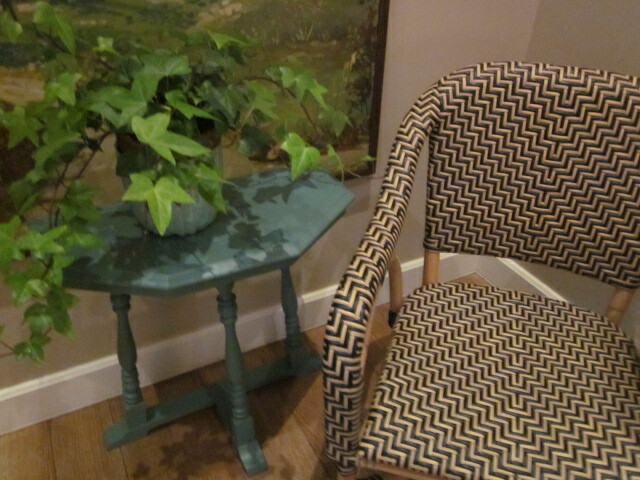 I love the color scheme…all rich and neutral with a pop of this great teal green in the side table. This was my favorite aunt Gladys’ color scheme of choice. I wonder if that fond memory has always influenced by affection for the color combination and why I have always been attracted to antique pottery (and new) in this color family. I keep a file of pictures like this so I don’t have to go back through all of my older magazines to find pictures that I eventually use as inspiration around the house whether it be for gardening, decorating or design. 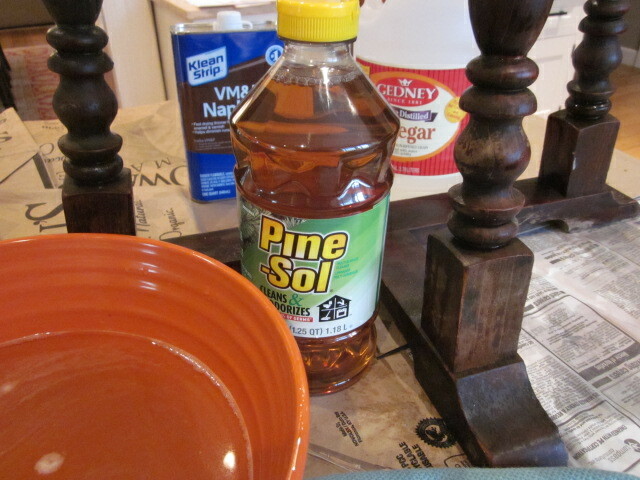 I cleaned the table with warm water and a little PineSol to remove the dirt. Then rinsed with clear water with a bit of white vinegar. I use this combination on most of my finds that need refurbishing. Then I allow it to dry thoroughly. I use satin latex paint for furniture. It gives it just enough sheen to be a bit easier to keep clean than a flat, matte finish would produce. Now the table is ready to use and adds a nice pop of color to the room. It is the perfect size and shape for a painted piece of furniture…really, an accessory all on its own. 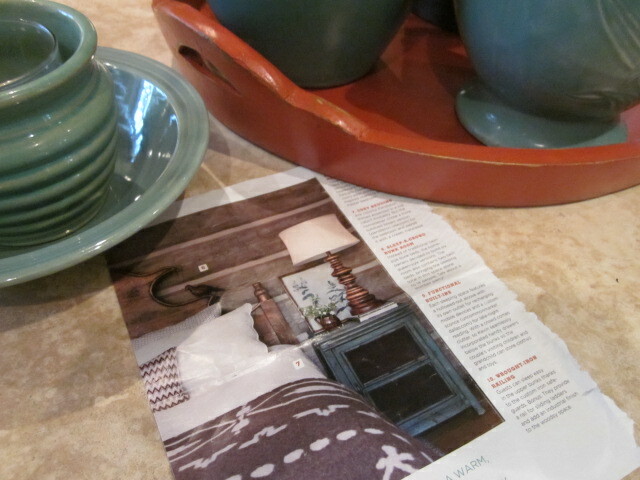 FYI…I used Benjamin Moore satin in Caribbean Teal. 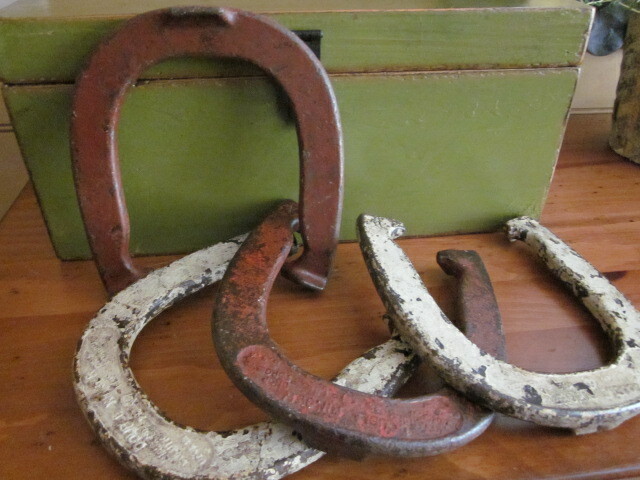 Next ups on the OLD IS NEW AGAIN category are were my father’s horse shoes that were used many a Sunday afternoon by my father and uncle Vernon at the lake cabin we now own. I still love the sound of clinking horse shoes that I can hear from the park across the river on a summer evening bringing back some very sweet memories. 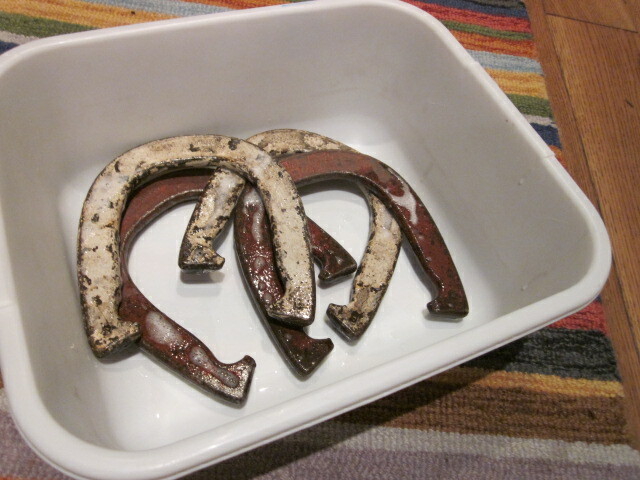 I am cleaning up the horse shoes with a good scrub of soapy water and then finishing with a spray of polyurethane to give a little clean sheen to the shoes and keep any further rusting from occurring. My son remembers playing a few games with his grandpa at the cabin and is now planning to use them as an accessory in his new office. It is always a good thing to have a fond memory around you on a daily basis. Now they are clean with a coat of finish and ready to display. 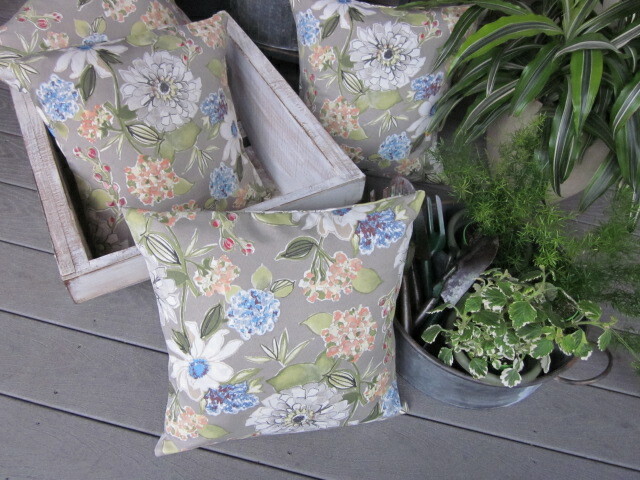 “TO DO” LIST PROJECT UPDATE…I did get four outdoor pillows made last week during our rainy weather for our patio chairs. I found an outdoor fabric at JoAnn Fabrics that coordinated with the chair color. Granted the fabric is waterproof, but I will often put them under cover when I know rain is in the forecast. I have a large drawer from an old pot-belly kitchen cupboard that I quickly pop them into and keep on my covered deck out of the rain. It makes them handy to grab and a good looking display of color and print on the deck while protected from the elements. It is a good feeling to have another project checked off my “To Do” list. Loving the cute quilt storage do over! Thanks…it is cute, especially in Ella’s room. It was the perfect style. Hi lynette, I love what you did with that beautiful old dresser. It certainly has had many uses in your family and now has one more. You couldn’t have found a better way to showcase your quilts or that lovely piece of furniture. I love the paint color and the new hardware. Thank Goodness you have a couple of handymen available to you. I have one also and would be lost without his woodworking skills! I enjoyed seeing all the things you accomplished in this post and the previous one. It’s just such a pleasure for me to read them and see what you’ve been up to! You are so creative and have many wonderful ideas along with the abilities to carry them out. Thank you for sharing every single bit of information with us! It was so fun getting all these projects finished. I love the “new” little quilt cupboard in Ella’s room. Love how your family has saved and repurposed the dresser so many times. 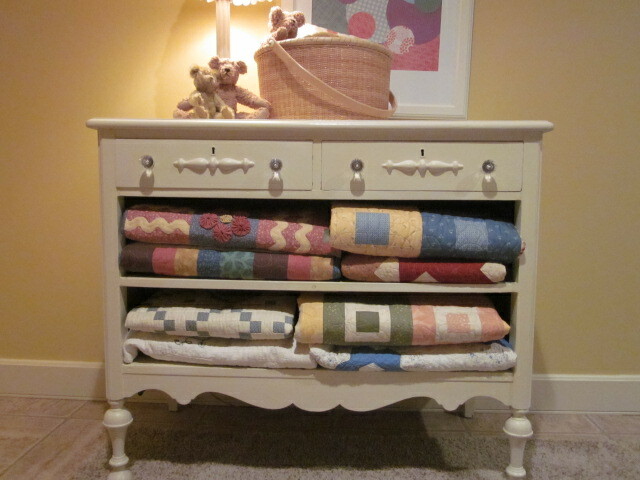 I love it as a quilt chest. 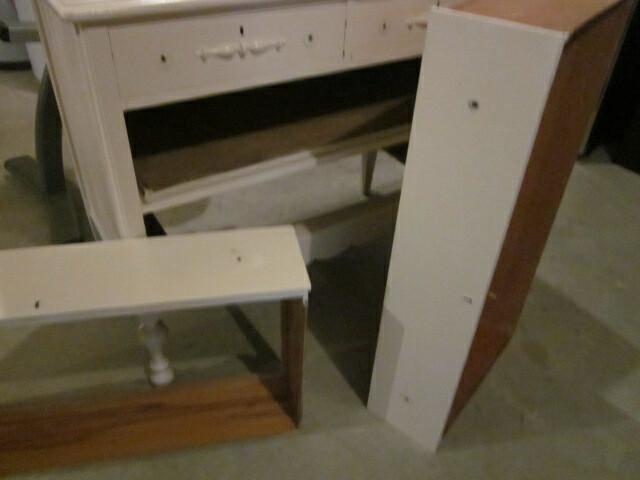 I am getting ready to paint a dresser pink for a new granddaughter. It was natural wood when I was a baby, white for my 3 babies, and now it transforms to pink! What fun memories. It feels good doesn’t it to make use of something with a little family history. Wow! What beautiful results from these projects. Love them all. Thanks for sharing. Thanks…it was a good weekend. The quilt cupboard is darling! The teal table is a great accent! I buy nearly every vintage Thimbleberries teal I can find. It makes such beautiful quilts. It was the perfect broken dresser for this project. Glad I saved it one more time.